POMONA, CA-FIFTH DAY OF WARPED TOUR! Here’s another ‘Warped Tour Edition’ of my series ‘Behind the Scenes’ with a Warped Tour veteran to try to get an idea of what really happens, and what really goes into working this very long, very hot, tour. This will give you some tips on what to wear/ where to eat/ how to get involved with the festival/ the do’s and don’ts of Warped Tour and some bands you should check out while there. Let the countdown begin! Kristin Biskup, 22, Tour Manager for Fearless Records on current Warped Tour ’12. How many summers on Warped? I have been attending Warped every year since 2003 and have toured with the tour for 3 years. How did you first get involved with the tour/ any previous experience? Since I was 15 years old, a goal of mine had been to go on tour. I don’t play any instruments so I can’t be a tech and I wasn’t a friend of any up and coming bands that were heading out on national tours in order to sell merch or tour manage so I had to make a name for myself another way. By the time summer of ’09 came around, I had been involved in various street teams, interned at a record label, and worked a huge music festival. It was the summer after my freshman year of college and I decided to actively try to find a job on Warped. The first touring job is always the hardest to come by. Even if there were job openings, companies wanted people who already had been on tour where they knew that they could handle living on the road. It definitely is a lifestyle that many don’t have the chance to experience but can be very demanding, especially the long hot days on Warped. After sending out a lot of resumes, Tooth and Nail asked if I was able to street team a few days for them. I found a band that was willing to have me ride in their van for the summer so Tooth and Nail ended up allowing me to street team for them for the whole tour. It was a crash course in the touring industry where I learned more than a classroom ever could. I have been touring every summer since! I was on Fearless Record’s street team for years so I was really excited when the opportunity came my way to go back on Warped in 2011 on behalf of the label. 9:00pm- __: Shower, party, bed. Stay hydrated! The crew is running around making sure everything works properly/is on schedule and the fans are going crazy in the pits/making sure they get to see all their favorite bands. The tour has done a great job over the past few years with lowering the cost of water and bringing sponsor Klean Kanteen (free, clean water) onboard to make sure that everyone gets enough fluids throughout the day. Do: Look out for each other! Don’ts: Be that person that makes everyone else’s day miserable. If you are a fan and going into the pit, don’t wear flip-flops. You will be shoeless in no time. Bring a backpack and prepare for the weather aka sunscreen and hoodie. 2009: Bayside changed their set daily so it was always a surprise as to what they played. My friend Margot and I would have ‘Bayside Dates’ and tried to catch their set almost every day. 2011: A Day to Remember and The Devil Wears Prada had explosive crowds where everyone looked like they were having fun. Best and worst part about working Warped? Worst: Long, hot, and dirty days. Was it/is it what you thought it would be like? Yes, and much more! It is great meeting everyone from the crew to bands to fans. You can always learn something new. The Gorge in Washington is breathtaking, absolutely beautiful. I love NJ and Philly because my friends get to come out and visit me. In 2011, the tour had two days off in New Mexico. A party was being thrown in the hotel bar when two of my friends got stuck in the elevator. The paramedics, police, and firefighters had to come to the hotel and break the doors open. People came out of the bar area and started to cheer them on. During this time, a few friends and I created the Fighting Five News Team to report on the progress of the rescue until they were freed an hour or so later. A tattoo studio was set up in a suite of the hotel where by the end of the night one of the news team members got a lightning bolt with the number five tattooed on his chest. It was a crazy, fun night! Also in 2011, the tour received a huge drop shipment of super soakers for all the bands. They were pretty decked out with one looking like a machine gun and another equipped with reload-able clips. The most intense soakers I have ever seen and was excited that I was able to get one. One morning, my friend Adam snuck underneath the back bottom of my tent wall and completely soaked me. I had nowhere to run, closed in by my merch tables and defenseless will my gun laying on top of the bin closest to him. Later that day, I walked behind his tent and through a gap unloaded my gun to the back of his head as I he was hanging out in his lounge chair. Little did I know that he had JUST showered and was feeling all nice and clean. Needless to say that I think I won that round. Be respectful to the tour! 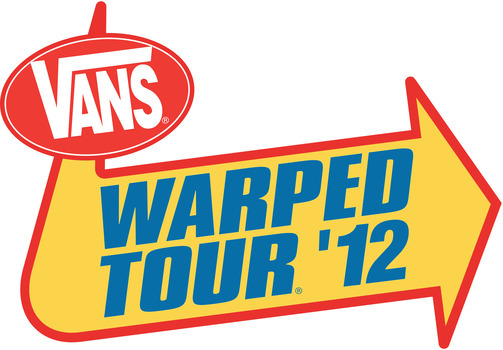 If someone wanted to work on Warped Tour how would they go about it? Street team/volunteer for labels and non-profits on the tour. Work really hard and who knows what can happen in the future. If you're going to be on tour this summer, what are you most looking forward to? I am really excited to see some old friends and meet new people. There are a lot of great bands out the road this year, especially those from Fearless Records (Breathe Caroline, Pierce the Veil, Lostprophets, Mayday Parade, Blessthefall, Tonight Alive, Motionless in White, Chunk! No Captain Chunk). Make sure to check them out and come by the Fearless Records tent! For anyone looking to get involved in the music/touring industry: No job is beneath you when you are starting out. Work hard and network!